At St. Oswald’s we offer our children a wide range of extra-curricular clubs and are fortunate it that we are able to enter a range of competitions for various sporting events. We aim to offer as many children as possible these competitive sports opportunities and build upon the school’s sporting successes. All clubs finish at 4pm promptly unless stated otherwise. The children earn credits for each session that they attend a club provided in our school. The credits build up throughout their time at our school and go towards achieving different awards – bronze, silver and gold levels, depending on the number of hours of learning achieved. 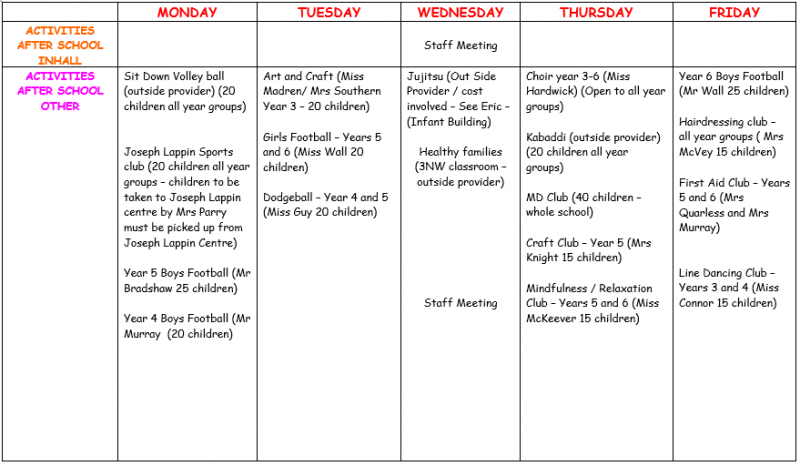 We are proud of the variety of after school clubs provided throughout our school, by staff and outside providers. Here are just a few that we have provided so far: Art club, Parachute games, Sports club, Choir, Storytelling, Movie club, Football, Sewing, Guitar, iPad club, Ju-Jitsu club, dance, Enterprise club, Spanish, Sign Language and Hairdressing.